Road-killed rare species – phascogales and bandicoots. It’s good to know these animals still survive in our landscape, but so sad that this is the only way most people get to see them. Long-nosed Bandicoots (Perameles nasuta – below) and Brush-tailed Phascogales (Phascogale tapoatafa – left) are both small marsupials and both have become quite rare in Victoria in recent decades. The Phascogale is a carnivorous marsupial in the Family Dasyuridae, which includes quolls, devils and thylacines, though most species are small and inconspicuous, like dunnarts, antechinus and planigales. Like other dasyurids, Brush-tailed Phascogales have a mouth full of sharp, pointy teeth, an open, cup-like pouch and all their toes are separate (not the case for kangaroos, possums & bandicoots, which have ‘grooming toes’). They are excellent climbers and have a curious life-history strategy (& more) that you can explore here, or here. This poor animal, a sub-adult female, was run over by a car on Boho Rd, just near Sawpit Gully Rd, in the region burnt by the recent 2013 Boho fires (map below) and found by Geoff Lucas. Read more about Brush-tailed Phascogales & Nestboxes for our area. Bandicoots are in the Family Peramelidae and the Long-nosed Bandicoot (Perameles nasuta)is the only species of this group found in the Strathbogie Ranges. Bandicoots are ground-dwelling and omnivorous, digging in the soil for worms, beetles, grubs, fungi and the succulent basal stems of select plants. They are secretive, nocturnal animals that stick to areas of dense cover. 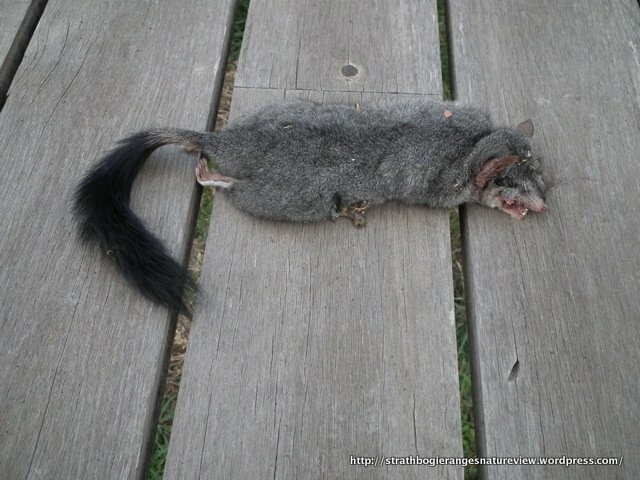 This roadkill was found in the Strathbogie Township, just near Spring Creek Bridge by Barb Selby and Bett Mitchell. Whilst sad, it’s definite proof that this species survives locally and is good reason to protect the dense shrubby and grassy habitat that still occurs in the vicinity – especially along local creek-lines and tea-tree swamps. Both records will be submitted to the Victorian Biodiversity Atlas. Next Next post: Stone artefacts – Srathbogie district. Pingback: Other wildlife braving the bridges | life. on.the.verge. Yep, sad indeed. Thanks for the link to your website – I hope some readers navigate there – lots of interest to read and see; that wildlife overpass in Brisbane is amazing! http://ksoanesresearch.wordpress.com/2012/08/03/so-youre-a-road-ecologist/ . The Strathbogie Ranges CMN is soon to start a nestbox project on Tuans and Sq Gliders, so we may get to see more of these animals. Great post! Always sad to see these little guys on the roadside. There are a few things we’re testing out, e.g. rope bridges, tunnels etc, to give them a helping hand. See here for a bit of info about crossing structures on the Hume Freeway http://ksoanesresearch.wordpress.com/roads-and-wildlife/ We get a few phascogales, often during their breeding season, which is always exciting. Thanks Bert. Tragic but heartening to think these animals are still around. Good reasons for a campaign to have restricted speed limits on our roads at night. And good pictorial signeage in areas known for wildlife crossings.